It seems that Lloyd Blankfein, the CEO of Goldman Sachs, may have been overstating the case in saying his firm doing God’s work. With his $67.9 million compensation in 2007 and payment of $20.2 billion to his co-conspirators, Blankfein appears to be a proverbial camel trying to pass through the eye of a needle. This compensation was paid in the year before the financial collapse brought on by the criminal actions of Lloyd and his fellow henchmen. After having his firm bailed out by the American middle class taxpayer at the behest of his fellow Goldman alumni Hank Paulson, Lloyd practiced his version of austerity by cutting compensation for his flock to only $16.2 billion ($500,000 per employee) in 2009. I’m all for people making as much money as they can for doing a good job. But, I ask you – What benefits have Goldman Sachs, the other Wall Street banks, and hedge funds provided for America? Never have so few, done so little, and made so much, while screwing so many. In 2005, the top 25 hedge fund managers “earned” $9 billion, or an average of $360 million. One year after a financial collapse caused by the financial innovations peddled by Wall Street, the top 25 hedge fund managers paid themselves $25 billion, or an average of $1 billion a piece. For some perspective, there were 7 million unemployed Americans in 2006. Today there are 14.6 million unemployed Americans. While the country plunges deeper into Depression, the barbarians pick up the pace of their plundering and looting of the remaining wealth of the nation. Bill Bonner and Lila Rajiva pointed out a basic truth in 2007, before the financial collapse. Ask the clients of Bernie Madoff how they are doing. The parallels between the period leading up to the Great Depression and our current situation leading to a Greater Depression are revealing. When you examine the facts without looking through the prism of party politics it becomes clear that when the wealth and power of the country are overly concentrated in the clutches of the top 1% wealthiest Americans, financial collapse and depression follow. This concentration of income and wealth did not cause the Stock Market Crash of 1929 or the financial system implosion in 2008, but they were a symptom of a sick system of warped incentives. 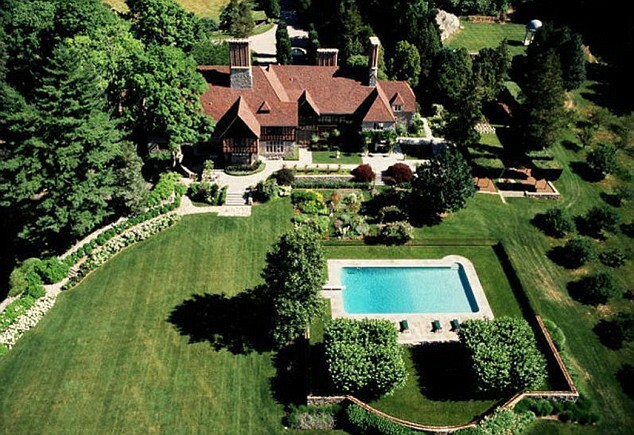 The top 1% of income earners were raking in 24% of all the income in America in 1928. After World War II until 1980, the top 1% of income earners consistently took home between 9% and 11% of all income in the country. 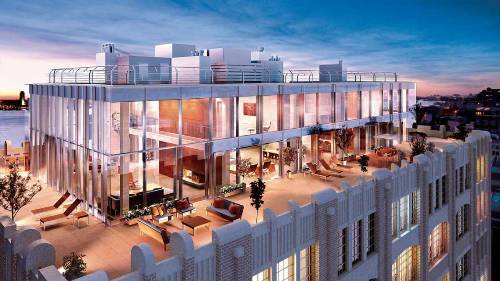 During the 1950′s and 1960′s when Americans made tremendous strides in their standard of living, the top 1% were earning 10% of all income. A hard working high school graduate could rise into the middle class, owning a home and a car. 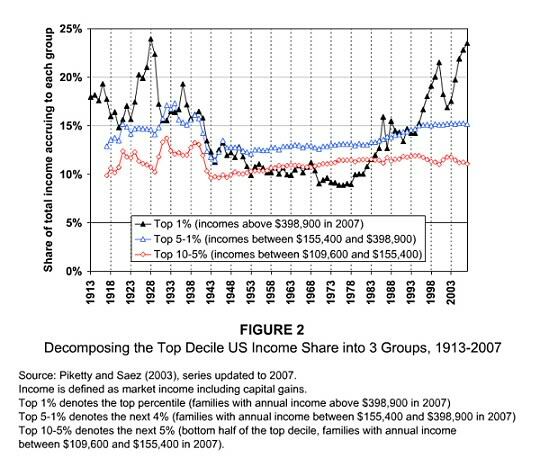 From 1980 onward, the top 1% wealthiest Americans have progressively taken home a greater and greater percentage of all income. It peaked at 22% in 1999 at the height of the internet scam. Wall Street peddled IPOs of worthless companies to delusional investors and siphoned off billions in fees and profits. The rich cut back on their embezzling of our national wealth for a year and then resumed despoiling our economic system by taking advantage of the Federal Reserve created housing boom. 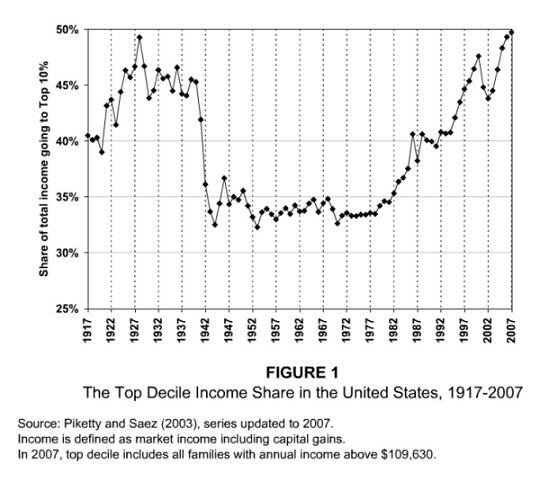 By 2007, the top 1% again was taking home 24% of the national income, just as they did in 1928. When the wealth of the country is captured by a small group of ruling elite through fraudulent means, collapse and crisis becomes imminent. We have experienced the collapse, while the crisis deepens. The Wall Street oligarchs were able to accumulate an ever increasing portion of corporate profits by inventing securitization, interest-rate swaps, and credit-default swaps which swelled the volume of transactions that bankers could make money on. These products were originally introduced as a means for corporations to hedge their risks. Wall Street shysters chose to use their “creative” financial products to build the biggest gambling casino in the history of the world. They functioned as the house, siphoning off billions in profits, but then got caught up in the hysteria and placed billions of bets themselves. This resulted in the financial industry generating 41% of all business profits in 2007. From World War II through 1980, financial industry profits ranged between 10% and 15%. Simon Johnson explains the despicable hijacking that has taken place since then. The original robber barons amassed huge personal fortunes, typically through the use of anti-competitive business practices. These well known titans of industry included Henry Ford, Andrew Carnage, John D. Rockefeller, and JP Morgan. They may have practiced questionable business ethics, but they did create wealth while benefitting the country as a whole. They introduced the automobile, provided the nation with steel, produced the oil that powered our economy, and brought order to industrial chaos of the day. It seems their fortunes were built by creating rather than destroying. The disgustingly rich Wall Street wheeler dealers who live in Greenwich CT and NYC and summer in the Hamptons have created nothing. Their immense wealth has been created through draining the economic system of its lifeblood. Their financial innovations have created no lasting benefit for our society. Wall Street knowingly created no documentation (liar loans) mortgage loans, Option ARM loans, and subprime loans. You do not create products that beg for fraud unless you want fraud. The packaging of these fraudulent mortgages into CDOs and CDSs by Wall Street’s crime machine benefitted Wall Street only. Those who got the loans defaulted, lost the homes, and had their credit ruined. Wall Street financiers have lured the American public into debt with easy credit and a marketing machine geared to convince the average Joe that he could live just like the rich. Simon Johnson explained the phenomena in a recent article. Capitalism is supposed to be an economic system in which the means of production and distribution are privately owned and operated for profit; decisions regarding supply, demand, price, distribution, and investments are not made by the government; Profit is distributed to owners who invest in businesses, and wages are paid to workers employed by businesses. The American economy is in no way a free market capitalistic system. It has become a oligarchic consumer capitalist society that is manipulated, in a deliberate and coordinated way, on a very large scale, through mass-marketing techniques, to the advantage of Wall Street and mega-corporations. When you hear the Wall Street class on CNBC argue against tax increases for the rich, they hark to the fact that small businesses would be hurt most by the expiration of the Bush tax cuts. There are 6 million small businesses in the US, with 90% of them employing less than 20 employees. These are not the rich. The vast majority of these businesses earn less than $1 million per year. There are only about 134,000 people in America who make on average $2.5 million per year. There are another 600,000 people who make on average $760,000 per year. Out of a workforce of 150 million, less than 1 million rake in over $750,000 per year. These are not small businesses. They are the Wall Street elite, corporate CEOs and the privileged classes that control the power in NYC and Washington DC. 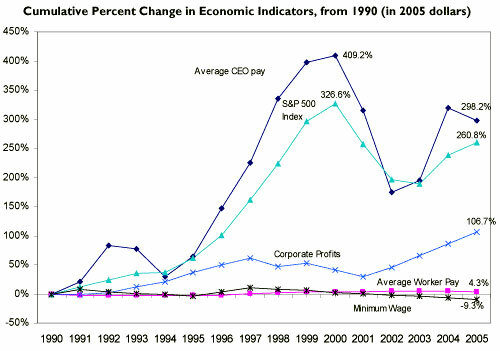 The following charts clearly show that perverse incentives in the US financial system have allowed corporate executives to reap ungodly pay packages, while the middle class workers who do the day after day heavy lifting in corporations have been treated like dogs. Considering the S&P 500, which measures the stock returns of the 500 largest companies in the U.S., has returned 0% for the last 12 years, the CEOs of these companies would slightly embarrassed paying themselves 300 times as much as their average workers. Not in the age of mammon. 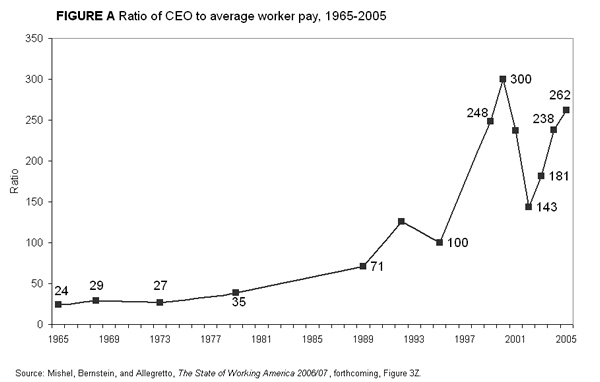 Big time CEOs are rock stars. Outrageous pay packages are a medal of honor in a world where humility and honor don’t exist. The Depression that currently is engulfing the nation was 30 years in the making. The criminal Wall Street financiers are the modern day John Dilingers. They have mastered the art of stealing from the masses while convincing these same people that they should admire them because they are rich. This is the oddity about Americans as pointed out by Bill Bonner and Lila Rajiva.